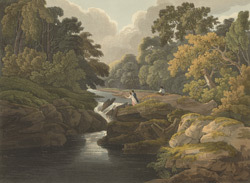 Engraver: Havell, R. & D.
View of part of the River Wharf near Bolton Priory, which is known as the Strid. The Strid lies south of Barden Bridge where the River Wharf narrows. Here water is forced through a narrow gap which is only approx. 2 metres wide in places. The Strid is actually a very treacherous place and anything that falls in is sucked down into underwater caves under the sides of the chasm.